A recent County Press article created the impression a planning inspector had upheld the council's basis for refusing a planning application for Newport power station. This was misleading. In fact the inspector rejected the principal reasons the council had given for refusing the application. What he did was deliver a lesson in industrial conservation to both council and developer. Built at the beginning or the 20th century, the power station presented a bold face to Newport town as a statement of the modern age, the stepped gables of its high facade designed to hide the business end at the rear. It is the imposing facade that has imprinted itself on locals, and the council seemed to have settled on saving just this and allowing the rest of the building to go. A few Islanders felt this was pseudo conservation and one objection to the planning application made that point, claiming the most critical feature of the building was the turbine hall and without it preservation would be meaningless. The objection was ignored. The planning application proposed townhouses incorporating the facade. The council made no objection to the rest of the building coming down but refused the application on a number of other grounds, broadly concluding the housing was unsuited to the surroundings. The developer appealed and the matter went before the Planning Inspectorate. The inspector disputed the key grounds of the council's refusal but, to the surprise of both developer and council, he rejected the appeal because limiting preservation to the building's facade was unacceptable. It would be "betraying its industrial purpose" and the preservation would be "rendered meaningless." As a result of this ruling, the council will presumably be seeking to retain its industrial context by laying down guidelines to conserve a wider aspect of the building, at the very least preserving the turbine hall. In our May article covering the power station we finished by saying "Hopefully the appeal will fail and the council will take the opportunity to apply a more professional evaluation to their preservation criteria." They now have little choice. The rear entrance to the turbine hall in Newport power station. The travelling crane used to lift the generators out for maintenance is still in place and can be seen at the top. This room was the heart of the operation and had to be protected from the dust and grime of the boiler section. 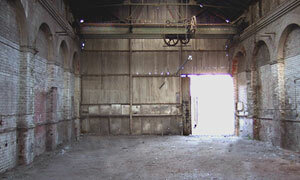 There are many examples of industrial premises from this period being converted for modern day use. The most famous conversion of a turbine hall is that of Bankside Power Station in London, now a key feature of Tate Modern. It is perhaps surprising that one of the most memorable vessels to emerge from Cowes shipbuilding history is a modest 41 ton ketch called the Bee. Her claim to fame is that she belongs to an exclusive group of working ships that sailed continuously for over a century. The hulk still exists, sunk into the west bank of the Medina. A recent flurry of interest has resulted in a plan to have it surveyed. Above: the Bee at work, date unknown. Below: the hulk today, sinking into the mud. 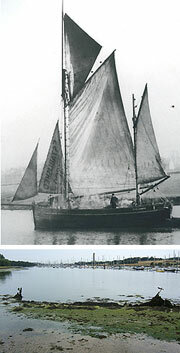 The Bee was built at Cowes in 1801 and finally laid to rest in 1927. She was a freighter, carrying goods to and from the Island, and is said to have made around 40,000 trips. The Bee's original owner is recorded as a Thomas Robinson, probably the corn merchant of Newport, at a time when the larger Island mills had begun using imported grain. In 1849 she was acquired by Shepard Brothers, a major Island freight service, transporting a variety of goods between Southampton and Newport. At the end of her working life she was run aground on the banks of the Medina, opposite the Folly. A degree of myth has built up around the Bee, including a claim she was a supply ship during the Battle of Trafalgar. There is no evidence for this. The story would appear to have developed from an anecdote that she carried flour from East Medina Mill to ships under preparation for the battle, which seems more likely. The Hants and Wight Trust for Maritime Archaeology will be visiting the site this month to assess if any work can be done on the hulk. Little of it is now visible, but its long working life could be attributed to the quality of its timbers and this may have helped preserve the remains under the mud bank. However, complete excavation would seem impractical, so it's not entirely clear what the ultimate aim of the project might be. Last month Cowes Hammerhead Crane received a blaze of publicity when English Heritage featured it in the launch of their Heritage at Risk campaign, highlighting the council's refusal to instigate repairs. Some of the complexities were inevitably lost to sound bites. A Freedom of Information request has now recovered the council's internal documents surrounding the issue. They reveal there may be forces against the crane within the council, and the reason they give for refusing repairs is not entirely genuine. The issue surrounds the council's decision not to serve an Urgent Works Notice for emergency repairs to the crane. The order was called for because the owner, Peter Harrison, is resisting his obligation to do the repairs, or allow anybody else access to do the work. He claims he doesn't actually own the crane, just the land it stands on. He reluctantly accepts that his stalled planning application for development of the area will have to include complete renovation of the crane. However, he would much prefer it to come down, so it's in his interest to deter the council from forcing repairs. An Urgent Works Notice enables a local authority to arrange for urgent repairs to be done to a listed structure in the face of an owner's resistance. Finance for the work is usually raised by the local authority and, once the work is completed, they can recover the money from the owner through the courts. In the case of the crane, the council claim recovering the money might prove difficult, particularly as Harrison is maintaining he doesn't own it. English Heritage have sought to reduce the council's risk by offering a grant of 80% towards the work, which is the limit their own guidelines will allow. The total cost of the urgent works is not precise but, if they cannot recover the money, it is thought the council will have to find between �10,000 and �18,000, plus legal costs. There has been no consideration of the money involved in the crane coming down. Ironically this would probably cost the council and/or Harrison more than complete renovation. The released documents show the council's own Conservation Department have strongly pressed for the works to be carried out. In September 2010 the Head of Planning, Bill Murphy, reviewed the matter and formally decided the council should go ahead and process the Urgent Works Notice. The decision was overturned by the Director of Economy and Environment, Stuart Love, presumably after consultation with others. He claimed the money could not be afforded in the present financial climate. The councillor with cabinet responsibily for the crane is Deputy Leader, George Brown. As a relatively recent Island resident, it is perhaps not surpising he takes a rather dim view of local heritage. His attitude is typified by "It is, of course, a farce to regard the crane as a structure of national importance, but we are stuck with it." Elsewhere he describes the Grade II* listing as "ridiculous." His general approach to our recorded past is revealed when he expresses a fear that the crane issue might encourage sentiment for our heritage and "Museums, Record Office etc. are still to come !" It seems Councillor Brown would be happy to see the crane fall down, and even happier if it fell on a museum. Much of the released correspondence shows officers apparently working to opposite aims. While some are trying to prove Harrison's legal ownership, others are throwing up additional reasons to resist the pressure from English Heritage. They have a stab at claiming the crane is not really at risk at all, then suggest English Heritage would have to pay some of the council's own labour costs. The matters raised often seem rather trivial and the cost factor itself is hardly great. As the correspondence continues, it's difficult to escape the conclusion that Stuart Love has some other reason to resist the works. And sure enough, in a single unguarded sentence, he lets slip the real reason the council are refusing to issue the Urgent Works Notice: "We do not have the capacity or skill in the operation to do this." The key factor is therefore a fear of their own inadequacy, not cost. It seems likely a select few have known this from the start, leaving their colleagues, English Heritage and others expending countless hours on pointless exchanges. The council are due to discuss the development with Harrison's agent in January. If they can reach agreement, the crane's renovation will form part of the planning application, although agreement is not a foregone conclusion. Now the council have refused to issue an Urgent Works Notice, Harrison knows he holds all the cards. He can either do nothing, and let it come down, or use it as a bargaining chip to get the development he wants. Supporters of the crane can only hope he opts for the latter. It is a sobering thought that a Grade II* listing counts for nothing if a powerful developer can so easily roll over a backwoods council.